On Monday, together with the Mining Injustice Solidarity Network, we helped deliver the below statement during 'Ecuador Day' at the 2017 Prospectors and Developers Association of Canada's annual convention at the Metro Toronto Convention Centre. Written and signed by over twenty Ecuadorian organizations, it questions the legitimacy with which Ecuador is being promoted as 'open for mining business' and the conflict that this has created - and is anticipated to continue fomenting - in mining-affected communities around the country where companies such as Toronto-based INV Metals are operating. The declaration points out outstanding legal and constitutional problems with plans to advance existing mining projects owned by Canadian, Chinese, and Chilean companies. The first irregularity mentioned is the 2008 Mining Mandate, which the Canadian Embassy together with numerous Canadian mining companies lobbied hard not to have applied, and to ensure that they – and not the country's mining-affected communities and representative organizations – would have a privileged seat at the table to develop the 2009 mining law. This did not meet the standard set by the Mining Mandate, nor have successive reforms. It also highlights how public debate and efforts to bring community complaints through various means have been suppressed through processes of criminalization and the use of armed forces to advance mining projects, which have ramped up since the 2009 mining law was passed. Recently this culminated with the two-month imposition of martial law on the entire province of Morona Santiago, where the Chinese consortium CRCC Tongguan hopes to open a large gold and copper mine on Shuar Indigenous ancestral territory, and about which you can find more information here and here. A mere three months from the end of its mandate, the Ecuadorian government has illegitimately ramped up an extractivist mining policy in the country. It has reopened the mining registry enabling new mining concessions to be granted nationwide, it has made administrative changes to enable large-scale industrial mining and for projects to advance from the exploration to the extraction stage, among other irresponsible and illegal acts as laid out in the Ecuadorian Comptroller General’s 2013 and 2016 reports. Minister Javier Cordova’s presence at the PDAC 2017 mining convention in Toronto, Canada, only accentuates community resistance to mining projects as a result of the human rights violations and environmental destruction that this activity entails. Shuar Indigenous territory in the southeastern Amazonian province of Morona Santiago is still in upheaval as a result of the recent forced displacement of communities that have been transformed into mining camps for the Panantza San Carlos and Mirador mining projects (currently owned by the Chinese consortium CRCC Tongguan and previously owned by Canadian junior mining company Corriente Resources). For two months, the government declared a "state of emergency" in the area (effectively imposing martial law), restricting the rights to "freedom of expression and opinion, association and assembly, free transit and inviolability of the home ...". The President of the Interprovincial Federation of Shuar Centres (FISCH from its initials in Spanish) was imprisoned and faces allegations of murder and of attacking or resisting some 84 people. 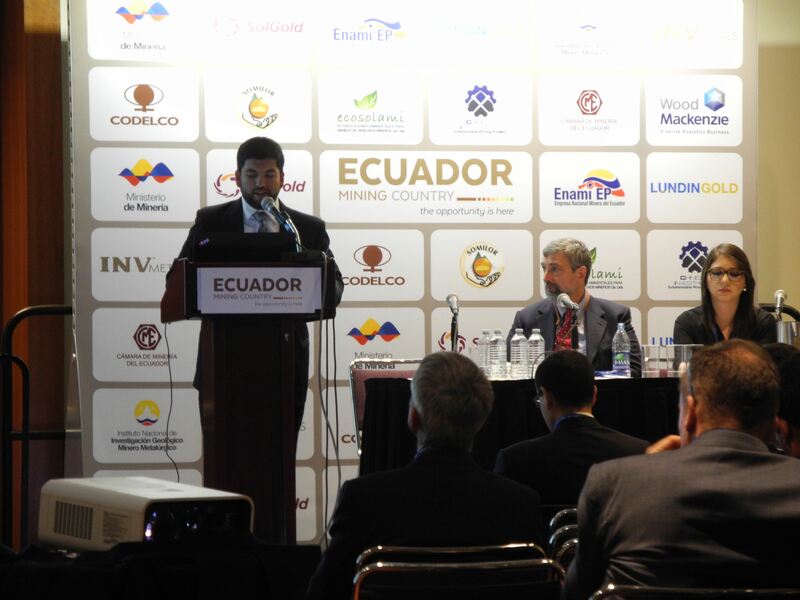 In the context of this still active turmoil in Ecuador, along with the opposition to mining expressed by mining-affected communities from around the country on February 6, 2017 at the Chilean, Canadian, and Chinese embassies in Quito (countries of origin for many companies operating in Ecuador), it is unacceptable that the government is promoting mining in Ecuador at an international mining convention. With mineral prices down, promoting mining in Ecuador translates into weakened social, environmental, and economic legal protections in the country. The 2009 Mining Law and subsequent reforms violate constitutional rights, ignore the role of decentralized autonomous governments, and subsidize mining activities through tax exemptions and other measures, which all economic activities in the country should comply with. Many community leaders have been victims of diverse forms of violence, while the material and intellectual authors of such acts enjoy impunity. Communities who protest mining activities that have violated their rights and destroyed the environment have been criminalized. Mining concessions that should have been extinguished according to the 2008 Mining Mandate (which ordered most mining concessions in the country to be revoked without economic compenstion for lack of prior consultation, overlap with water supplies and protected areas, for having being obtained through influence trafficking, among other criteria). Violation of the right to free, prior and informed consultation. Violation of norms that establish the supremacy of the Constitution and international human rights treaties over any other legal norm or act of state authority (Articles 424, 425 and 426). Mining concessions in Ecuador overlap with protected areas, water sources, protected forests, fragile high altitude wetlands known as páramo, Indigenous territories, Afro-Ecuadorian communities, populated areas and farming areas. Those attending the mining fair should be aware of the increasing conflict that mining is creating in diverse parts of the country, which will only continue to grow with greater promotion of mining activities in the country.